North Carolina State’s Bradley Chubb, 2017 winner of the Bronko Nagurski Trophy. Photo by Michael Strauss. 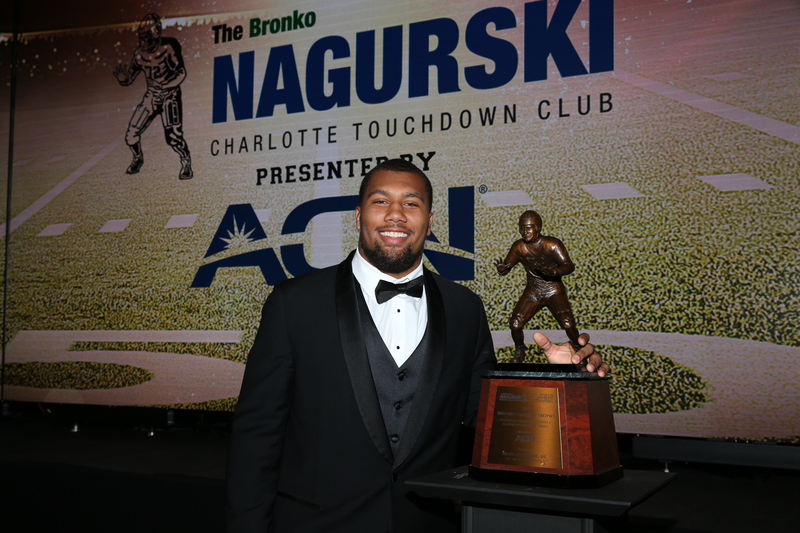 CHARLOTTE, N.C. (FWAA) – North Carolina State end Bradley Chubb was named the recipient of the 2017 Bronko Nagurski Trophy on Monday night before a sold-out banquet crowd of 1,200 people at the Charlotte Convention Center. Chubb, a 6-4, 275-pound senior from Marietta, Ga., accepted the award given to the best defensive player in college football before a large contingent of Wolfpack supporters, including his head coach Dave Doeren. Chubb is the first Wolfpack player to receive the Football Writers Association of America’s National Defensive Player of the Year Award, which has been selected by the organization since 1993. He’s the fourth Atlantic Coast Conference player to win the award in the last eight seasons, including Boston College linebacker Luke Kuechly (2011), now a member of the NFL’s Carolina Panthers. Chubb, second in the FBS in tackles for loss and eighth in sacks this season, claimed the award at the Charlotte Touchdown Club banquet sponsored by ACN. He was chosen over four other finalists: Alabama safety Minkah Fitzpatrick, Iowa linebacker Josey Jewell, Houston tackle Ed Oliver and Georgia linebacker Roquan Smith. Chubb, who is the ACC’s 2017 Defensive Player of the Year, set North Carolina State career records for tackles for loss (60) and sacks (26). Those marks are tied for fourth and tied for 18th, respectively, in ACC history. A three-time ACC Defensive Lineman of the Week (vs. Florida State, Syracuse and Boston College), Chubb played 87 percent of the snaps against ACC competition this season. In addition to the 2017 Bronko Nagurski Trophy winner’s announcement, the banquet Monday night celebrated the recipient of the Bronko Nagurski Legends Award, sponsored by the CTC and Florida East Coast Railway. Notre Dame’s Ross Browner, a member of the FWAA’s 1976 and ‘77 All-America teams, winner of the 1976 Outland Trophy and a member of the College Football Hall of Fame, was this year’s Legends Award recipient. Bound for the College Football Playoff, Georgia head coach Kirby Smart was the keynote speaker at the banquet. The FWAA has chosen a National Defensive Player of the Year since 1993. In 1995, the FWAA joined with the CTC and named the award in honor of the legendary two-way player from the University of Minnesota. Nagurski dominated college football then became a star for professional football’s Chicago Bears in the 1930s. Bronislaw “Bronko” Nagurski is a charter member of both the College Football and Pro Football Halls of Fame. The Bronko Nagurski Trophy is a member of the National College Football Awards Association (NCFAA), which encompasses college football’s most prestigious awards. Founded in 1997, the NCFAA and its 24 awards now boast over 800 recipients, dating to 1935. Visit ncfaa.org to learn more about our story. The Football Writers Association of America, founded in 1941, consists of 1,300 men and women who cover college football. The membership includes journalists, broadcasters and publicists, as well as key executives in all the areas that involve the game. The FWAA works to govern areas that include game-day operations, major awards and its annual All-America team. For more information about the FWAA and its award programs, contact Steve Richardson at tiger@fwaa.com. Electrolux is a global leader in appliances for household and professional use, selling more than 50 million products to customers in more than 150 countries every year. The company focuses on innovations that are thoughtfully designed, based on extensive consumer insight, to meet the real needs of consumers and professionals. Electrolux products include refrigerators, dishwashers, washing machines, vacuum cleaners, cookers and air-conditioners sold under esteemed brands such as Electrolux, Frigidaire, Kelvinator, AEG, and Eureka. In 2012, Electrolux had sales of $17 billion ($5.1 billion in North America) and 58,000 employees. The Electrolux North American headquarters is located at 10200 David Taylor Drive, Charlotte, NC 28262 in the University Research Park. For more information visit http://newsroom.electrolux.com/us/. Charlotte, N.C. February 15, 2017 — The Charlotte Touchdown Club in conjunction with the Football Writers Association of America and Florida East Coast Railway proudly announces University of Notre Dame great Ross Browner as the recipient of the 2017 Bronko Nagurski Legends Award, which recognizes outstanding defensive football players from the past 40 years. The award will be presented formally during the annual Bronko Nagurski Trophy Awards Banquet presented by ACN on December 4, 2017. 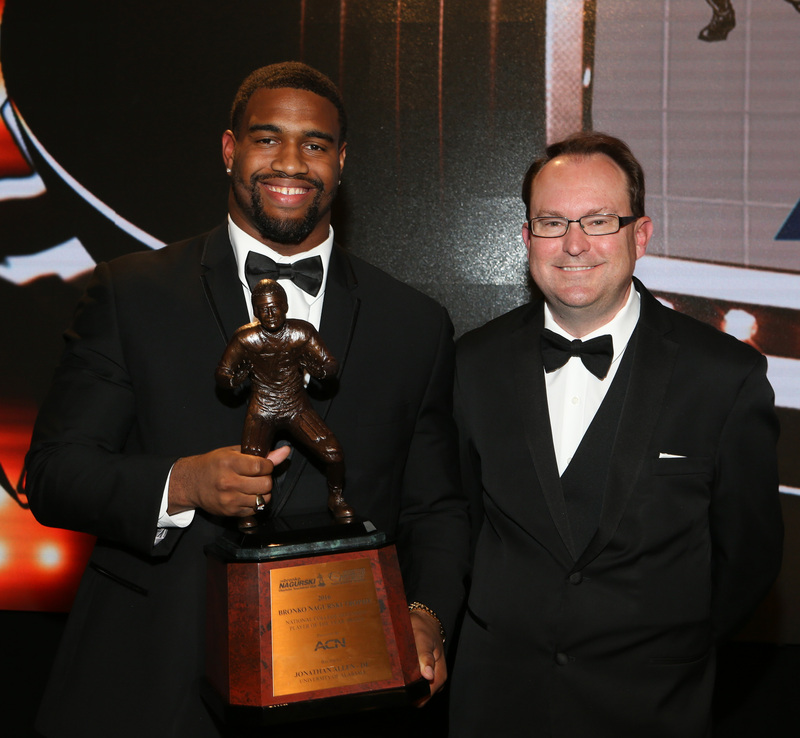 The 2016 Bronko Nagurski Trophy was awarded to Alabama defensive end Jonathan Allen on Dec. 5 at a banquet organized by the Charlotte Touchdown Club in Charlotte, N.C.
CHARLOTTE, N.C. — Finally, the Alabama Crimson Tide landed a winner in the Bronko Nagurski Trophy balloting: defensive end Jonathan Allen. The nation’s top-ranked team, attempting to win a second straight national title and fifth in eight years, saw Allen claim the trophy as the best defensive player in college football, as chosen by the Football Writers Association of America. Alabama has had a Nagurski finalist seven times in the last eight years; in fact, the Crimson Tide had two of the five 2016 Nagurski finalists. The previous six times, a Crimson Tide player didn’t get the nod in Charlotte. But Allen, a 6-3, 291-pound senior from Leesburg, Va., broke that streak after returning for his senior season to improve his draft status. Alabama defensive end Jonathan Allen, winner of the 2016 Bronko Nagurski Trophy, poses with 2016 FWAA President Mark Anderson. The finalists on hand for the banquet hosted by the Charlotte Touchdown Club were: Allen, Alabama linebacker Reuben Foster, Florida State cornerback Tarvarus McFadden, Michigan linebacker Jabrill Peppers and Clemson end Christian Wilkins. Projected as a high first-round pick in next spring’s NFL Draft, Allen has been nicknamed “Superman” for some of his plays. Allen is a standout on the nation’s best defense, which, until the SEC Championship Game, hadn’t given up a touchdown since Oct. 22 against Texas A&M. Allen is second on the Crimson Tide’s career sack list with 26.5 and has nine sacks for 72 yards in losses this season. He has 15 quarterback hurries, has broken up two passes, and blocked a kick. He has scored touchdowns on two fumble recoveries – a 75-yard return against Ole Miss and a 30-yard return against Texas A&M. The Bronko Nagurski Trophy winner was chosen from the five finalists who are part of the 2016 FWAA All-America Team. The FWAA All-America Committee, after voting input from the association’s entire membership, selected the Nagurski Trophy finalists and winner. In addition to the 2016 Bronko Nagurski Trophy winner’s announcement at the Charlotte Convention Center, the banquet celebrated the recipient of the Bronko Nagurski Legends Award, sponsored by the CTC and Florida East Coast Railway. Navy’s Chet Moeller, a member of the FWAA’s 1975 All-America Team and a College Football Hall of Famer, was honored. Duke head coach David Cutcliffe was the keynote speaker at the banquet. The FWAA has chosen a National Defensive Player of the Year since 1993. 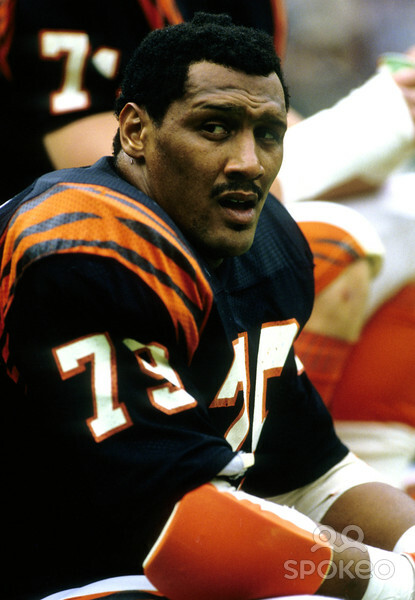 In 1995, the FWAA named the award in honor of the legendary two-way player from the University of Minnesota. Nagurski dominated college football, then became a star for professional football’s Chicago Bears in the 1930s. Bronislaw “Bronko” Nagurski is a charter member of both the College Football and Pro Football Halls of Fame. The Football Writers Association of America, founded in 1941, consists of 1,400 men and women who cover college football. The membership includes journalists, broadcasters and publicists, as well as key executives in all the areas that involve the game. The FWAA works to govern areas that include game-day operations, major awards and its annual All-America team. For more information about the FWAA and its award programs, contact Steve Richardson at tiger@fwaa.com. The Bronko Nagurski Trophy is a member of the National College Football Awards Association (NCFAA) which encompasses the most prestigious awards in college football. The 22 awards boast more than 700 years of tradition-selection excellence. Visit ncfaa.org to learn more about our story. The Charlotte Touchdown Club is a non-profit organization founded in 1990 for the purpose of promoting high school, collegiate, and professional football in the Charlotte, N.C., region. The club’s activities and services focus community attention on the outstanding citizenship, scholarship, sportsmanship, and leadership of area athletes and coaches. For more information, contact John Rocco (704-347-2918 or jrocco@touchdownclub.com). The official website of the Charlotte Touchdown Club is touchdownclub.com. ACN, Inc. Founded in 1993, ACN is the world’s largest direct seller of telecommunications and essential services for residential and business customers. ACN provides the services people need and use every day including Home Phone Service, High Speed Internet, Wireless, Television, Home Security & Automation, Computer Support and Natural Gas and Electricity. ACN operates in 23 countries with offices located throughout North America, Europe, Asia and the Pacific. For more information, visit myacn.com. For information on ACN’s home-based business opportunity, visit acninc.com. Florida East Coast Railway FECR is a regional freight railroad that extends along a 351-mile corridor between Jacksonville, Fla., and Miami, Fla., with exclusive rail access to the Port of Palm Beach, Port Everglades (Ft. Lauderdale) and the Port of Miami. For more information, visit fecrwy.com. Electrolux Electrolux is a global leader in appliances for household and professional use, selling more than 50 million products to customers in more than 150 countries every year. The company focuses on innovations that are thoughtfully designed, based on extensive consumer insight, to meet the real needs of consumers and professionals. Electrolux products include refrigerators, dishwashers, washing machines, vacuum cleaners, cookers and air-conditioners sold under esteemed brands such as Electrolux, Frigidaire, Kelvinator, AEG, and Eureka. In 2012, Electrolux had sales of $17 billion ($5.1 billion in North America) and 58,000 employees. The Electrolux North American headquarters is located at 10200 David Taylor Drive, Charlotte, NC 28262 in the University Research Park. For more information visit http://newsroom.electrolux.com/us/. The Charlotte Touchdown Club in conjunction with the Football Writers Association of America and Florida East Coast Railway, proudly announced Tuesday that U.S. 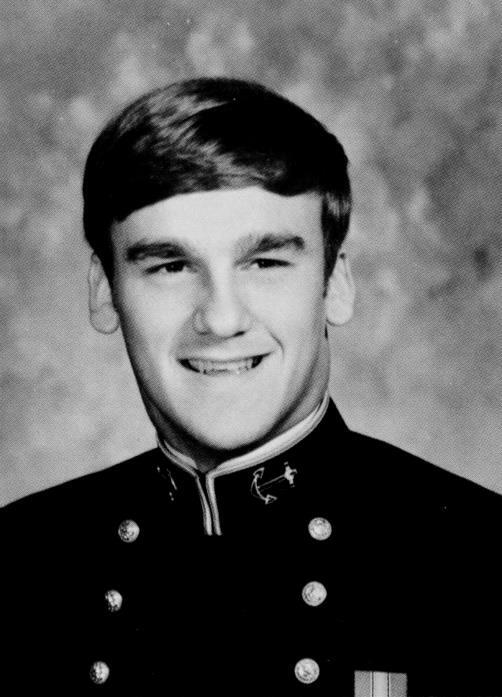 Naval Academy great Chet Moeller will be the recipient of the 2016 Bronko Nagurski Legends Award, which recognizes outstanding defensive football players from the past 40 years. The award will be presented formally during the annual Bronko Nagurski Trophy Awards Banquet presented by ACN on December 5th. “Being recognized with the 2016 Bronko Nagurski Legends Award conjures up memories which will live with me forever. I’m thankful for the coaches who shaped me and the teammates who encouraged me and I’m overwhelmed to be considered in the same class of the past winners such as Bubba Smith, Randy Gradishar, Randy Rhino and others,” Moeller said. These pictures, from the Dec. 7 banquet for the presentation of the Bronko Nagurski Trophy to Temple senior linebacker Tyler Matakevich, were provided by the Charlotte Touchdown Club and Treasured Events of Charlotte. Matakevich is the 23rd winner of the Bronko Nagurski Trophy, which goes annually to FWAA’s selection as the best defensive player in college football. Temple linebacker Tyler Matakevich, winner of the 2015 Bronko Nagurski Trophy, with FWAA 2015 president Lee Barfknecht. Photo by Ron J.Deshaies/Treasured Events of Charlotte. Finalists for the 2015 Bronko Nagurki Trophy (left to right): Jeremy Cash of Duke, Carl Nassib of Penn State, Shaq Lawson of Clemson, Reggie Ragland of Alabama and winner Tyler Matakevich of Temple. Photo by Ron J.Deshaies/Treasured Events of Charlotte. Temple linebacker Tyler Matakevich on the big screen as the finalists for the Bronko Nagurski Trophy were introduced. Photo by Ron J.Deshaies/Treasured Events of Charlotte. FWAA President Lee Barfknecht speaks at the Bronko Nagurski Trophy presentation banquet in Charlotte. Photo by Ron J.Deshaies/Treasured Events of Charlotte. Temple linebacker Tyler Matakevich steps forward to accept the Bronko Nagurski Trophy after being named the 2015 winner by FWAA President Lee Barfknect (right). Photo by Ron J.Deshaies/Treasured Events of Charlotte. Former Ohio State linebacker Randy Gradishar, a member of the FWAA’s 1973 All-America Team, received the Bronko Nagurski Legends Award. Photo by Ron J.Deshaies/Treasured Events of Charlotte. Auburn coach Gus Malzahn was the keynote speaker at the Bronko Nagurski Trophy presentation banquet on Dec. 7, 2015, in Charlotte. Photo by Ron J.Deshaies/Treasured Events of Charlotte. The Bronko Nagurski Trophy, presented annually since 1993 by the Football Writers Association of America to the best defensive player in college football. Photo by Ron J.Deshaies/Treasured Events of Charlotte. The stage is set for the presentation of the 2015 Bronko Nagurski Trophy. Photo by Ron J.Deshaies/Treasured Events of Charlotte. Table decorations at the Bronko Nagurski Trophy presentation banquet in Charlotte. Photo by Ron J.Deshaies/Treasured Events of Charlotte. Signing cards available to guests who wanted autographs from Randy Gradishar and the finalists for the 2015 Bronko Nagurski Trophy. Photo by Ron J.Deshaies/Treasured Events of Charlotte. The Charlotte Touchdown Club’s logo was carved in ice for a reception preceding the banquet and presentation of the 2015 Bronko Nagurski Trophy. Photo by Ron J.Deshaies/Treasured Events of Charlotte. Bronko Nagurski Legends Award winner Randy Gradishar, Shaq Lawson of Clemson, Reggie Ragland of Alabama, Tyler Matakevich of Temple and Carl Nassib of Penn State take part of a forum with students from Charlotte area schools. Photo by Ron J.Deshaies/Treasured Events of Charlotte. Jerseys of former standout players that were up for bids in a silent auction before the Bronko Nagurski Trophy presentation banquet. Photo by Ron J.Deshaies/Treasured Events of Charlotte. CHARLOTTE, N.C. — Temple senior linebacker Tyler Matakevich was named the 2015 Bronko Nagurski Trophy winner on Monday night, a feat paralleling his team’s rise to its first Top 25 ranking since 1980 and record-tying 10-victory season in which the Owls won the American Athletic Conference’s East Division crown. The Football Writers Association of America and the Charlotte Touchdown Club made the announcement at a gala banquet presented by ACN at the Westin Hotel in downtown Charlotte, N.C. Matakevich, the school’s all-time tackle leader, is the first major award winner for Temple (10-3), which is headed to the Marmot Boca Raton Bowl to play Toledo on Dec. 22. This year’s banquet marks the 21st anniversary of the event in Charlotte, where Matakevich beat out the other finalists: Duke safety Jeremy Cash, Clemson end Shaq Lawson, Penn State end Carl Nassib and Alabama linebacker Reggie Ragland. The 6-1, 232-pound Matakevich, the first, first-team defensive All-American in Temple history, now has collected the title as the best defensive player in college football. 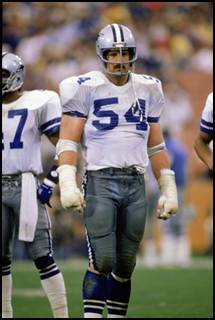 Adding to the story, Temple was the only Football Bowl Subdivision school to recruit him out of Stratford, Conn.
CHARLOTTE, N.C. – The Charlotte Touchdown Club, in conjunction with the Football Writers Association of America and Florida East Coast Railway, proudly announces that Randy White will be the recipient of the 2014 Bronko Nagurski Legends Award, which recognizes outstanding defensive football players from the past 40 years. The award will be presented formally to White during the annual Bronko Nagurski Trophy Awards Banquet on Monday, December 8 at The Westin Hotel. 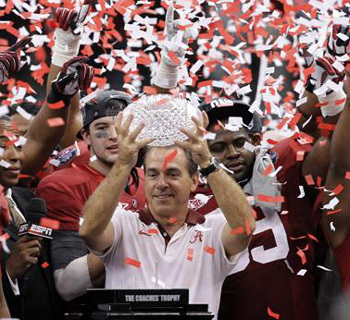 University of Alabama head coach Nick Saban will be the keynote speaker. For Reservations or Information on how to become a member of the Club’s Sponsor Team, please call 704-347-2918 or email John Rocco atjrocco@touchdownclub.com.